Washington Nationals ace Stephen Strasburg pitched seven strong innings and struck out nine and won for the first time in the month of June as the Nats beat the Colorado Rockies 2-1. 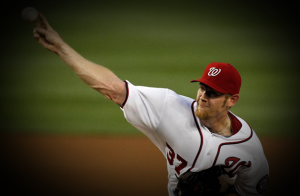 Strasburg (4-6) allowed one run on five hits for his first victory since May 31. Reliever Drew Storen worked the eighth and Rafael Soriano pitched the ninth for his 19th save as the Nationals moved one game above .500 at 37-36. Ian Desmond homered in the seventh for Washington. DJ LeMahieu at the lone RBI for the Rockies in the third inning. The Rockies have scored two runs in the first two games of the series and have lost five straight. Nationals manager Davey Johnson said he expects OF Bryce Harper to begin a rehab assignment at single-A Potomac on Tuesday.